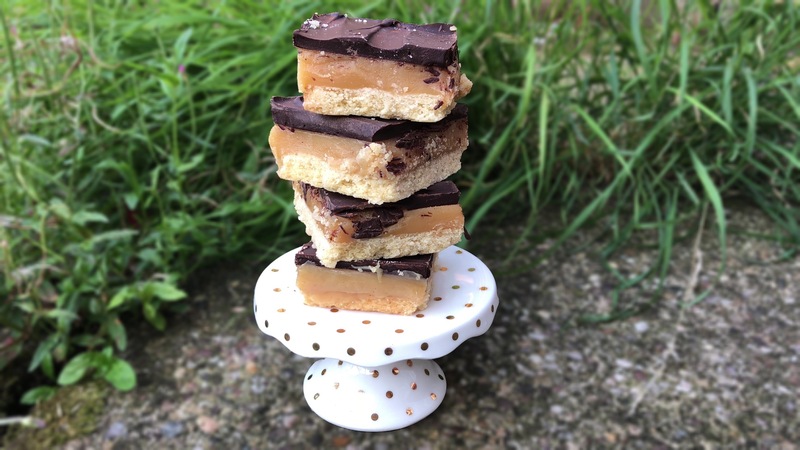 If you’re here looking for a super simple recipe on how to make millionaires shortbread, I’ve got you covered. Anyway, I’m going to share my recipe on how to make the millionaires shortbread. It’s quick, easy and doesn’t require many ingredients, which is always a good thing! The process of making the different parts isn’t exactly hard, nor do they take a lot of time to do. Making the shortbread will vary, depending on the method you use. 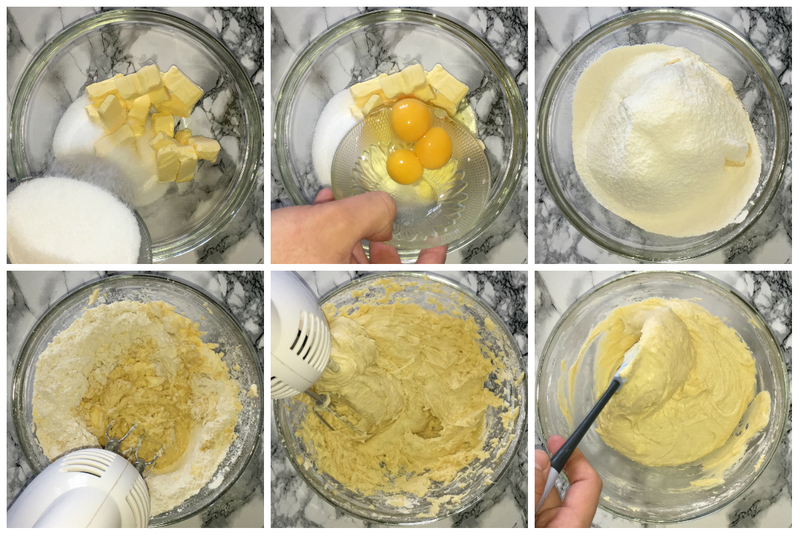 There are two ways to make the dough, method 1 is using a food processor and method 2 is making it by hand. Both methods will work equally as well but method 1 is quicker than method two, however, method 2 is ideal if you don’t have a food processor or prefer to be hands on when making doughs. Before you get into making this, you’ll want to do a small bit of prep. Measure out all of your ingredients in advance, this just saves you making mistakes and faffing about. Also, don’t forget to preheat your oven to 180˚c/350˚f. 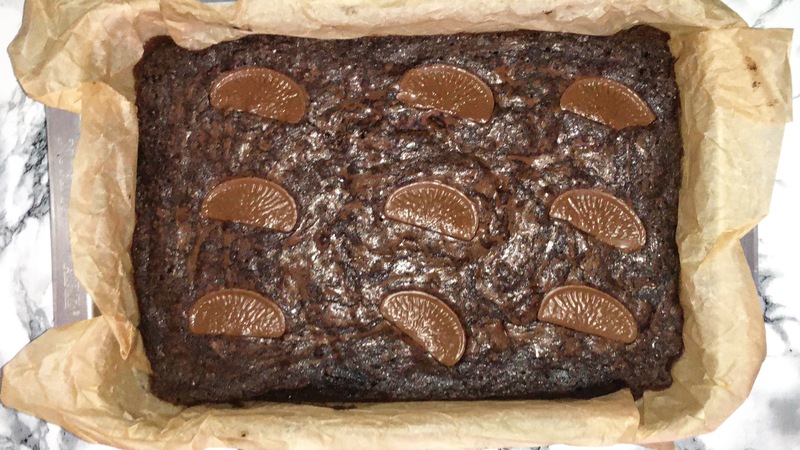 The baking tin I’m using is 11×7 inches but feel free to use a 9 inch square. To make the shortbread layer, place your flour, sugar and butter into either your food processor or mixing bowl and pulse/rub in until its combined. Once you see a clear dough has formed, stop mixing and set aside while you prepare your tin, lining it with some greaseproof paper. Place your shortbread into your prepared tin and press it out until you have a level layer, I found using my hands and a small cup measurement really helps to spread it out and get it level. Do whatever works best for you. Bake in your preheated oven for 20-22 minutes (or until slightly coloured around the edge. While your shortbread is baking, feel free to make the caramel layer. 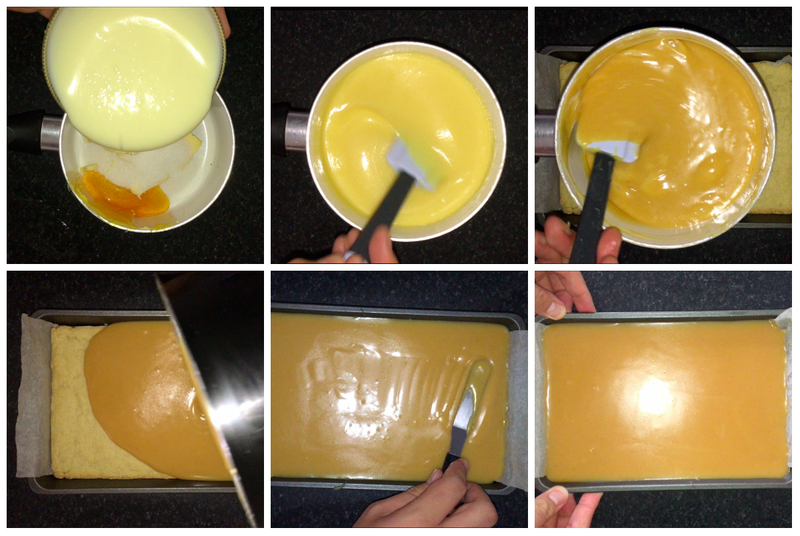 To make the caramel layer, it’s really easy. Get a small-medium saucepan and place the butter, sugar, golden syrup and condensed milk and place on the hob over a low-medium heat and continuously stir it until it melts, it will then become darker in colour, it should be a golden brown colour, no lighter or darker. Once you’ve achieved the right colour, pour the caramel over the baked biscuit base and level it off as best you can using a silicon spatula or cranked palette knife. Place this in the fridge until its cooled down, it should be firm to the touch. This doesn’t take very long. The final layer is the chocolate layer. This is probably the easiest and most simple layer to do plus you can customise it to suit you. I chose to use dark chocolate (as it was all I had in) but feel free to use milk chocolate, if you’d prefer to. All you need to do is melt your chocolate, my preferred method is to melt the chocolate in a bowl over a saucepan of simmering water and stirring it often until melted. If you don’t like using this method, feel free to microwave the chocolate on 20-30 second intervals, stirring well in-between each interval, be careful not to burn the chocolate. Pour the chocolate over the top of your cooled and firmed caramel and level the chocolate off as best you can using a offset/cranked palette knife, place the baking tray back in the fridge and allow the chocolate to firm up. 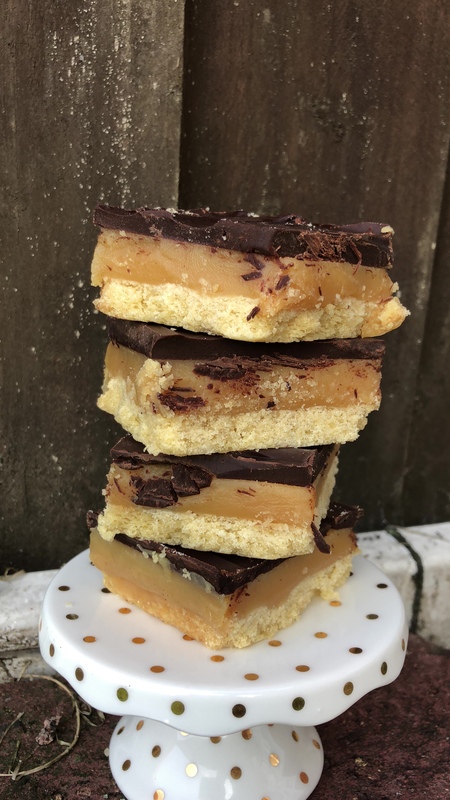 Once the chocolate has firmed up, remove the millionaires shortbread from the tin (you may need to run a knife down the sides) and cut it up into slices, I cut mine into squares but feel free to cut yours into slices that suit you best. 300g Chocolate (dark or milk, whichever you prefer best). Do some prep work now, weigh up your ingredients, this saves you making mistakes later on and stops you faffing about later. Preheat your oven to 180˚c/350˚f. 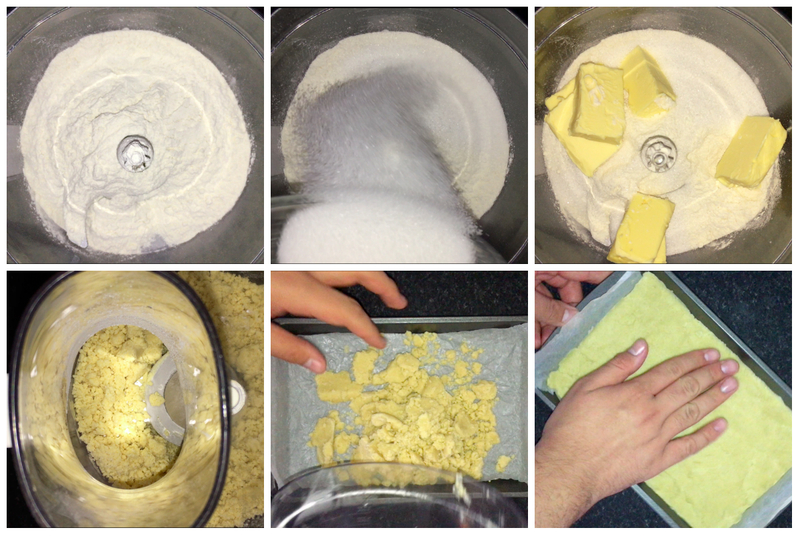 When it comes to making the shortbread, you can do it 2 ways, using a food processor or by hand. Either method will get you the results you’re looking for, I used the food processor method. Place the flour, sugar and butter into your food processor or mixing bowl of choice and pulse/rub them together until a clear dough forms. Be careful not to over-mix it at this stage, otherwise your shortbread will be tough once baked. Line your baking tray with a piece of baking paper/parchment and place the shortbread dough into the prepared tin, feel free to do this by using your hands or a small cup measurement, try and get the layer of shortbread as level as possible. Once level, place your shortbread into the preheated oven and bake for around 20-22 minutes or until slightly coloured around the edge. I recommend making your caramel filling once your shortbread has been in the oven for round 10-15 minutes. The caramel is really easy to make, get yourself a small-medium saucepan and place the butter, granulated sugar, golden syrup and condensed milk into your saucepan and place on the hob over a low-medium heat, once it starts to melt, you’ll want to continuously stir the mixture. You’ll notice it goes from a yellow-ish colour to a golden brown colour, this is when you know it’s done. 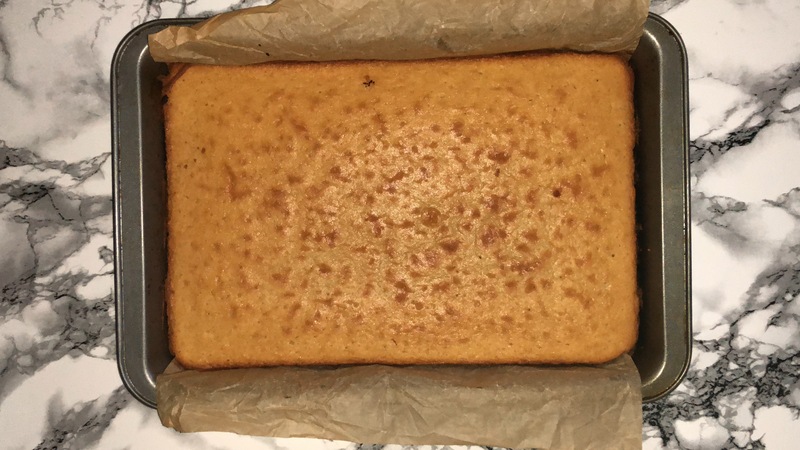 Once your caramel filling is done, pour it over the baked shortbread base and level out the caramel using a spatula or cranked/offset palette knife then place in the fridge to set completely cool and firm up. This doesn’t take very long. Once your caramel layer has set, you can melt your chocolate. For the chocolate, feel free to use milk or dark chocolate, choose your preference. You can melt the chocolate 2 different ways, method 1 is placing the bowl of chocolate over a saucepan of simmering water, stirring often once it starts to melt. Method 2 is placing the chocolate into a microwave safe bowl and microwave the chocolate in 30 second intervals until melted. Either method will work, I chose method 1 as this is my preference. Pour the chocolate on top of the firmed caramel layer and spread it out using a cranked/offset palette knife or the back of a spoon and level out the chocolate as best you can. Place back in the fridge and allow the chocolate to firm up completely. To finish the millionaires shortbread, all you need to do is to remove it from the tray and cut it up into slices, I chose squares but feel free to cut them up however you like. If you’re looking for a nostalgic recipe for chocolate concrete, you have come to the right place. I have the recipe that’ll hit the spot! As mentioned above, this recipe is another recipe that has been around for many years and enjoyed by many people. If you were at school any time between the 1970s and the 2000s, then you should remember this being served at lunch times every now and again. If you remember this, do you remember pink custard? 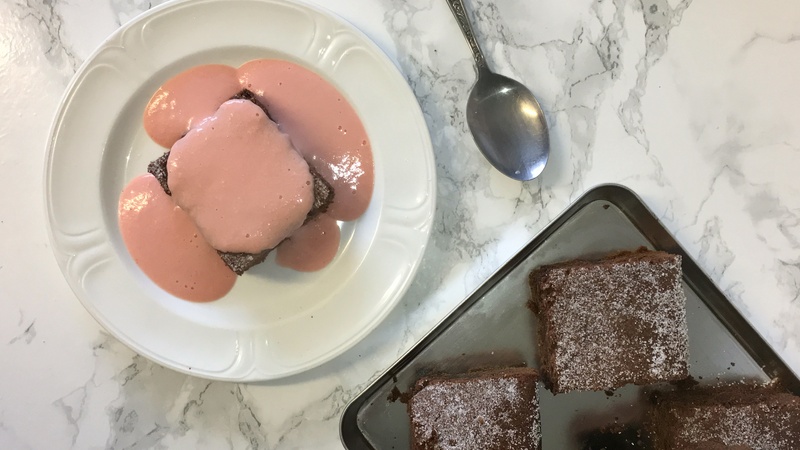 Chocolate concrete and pink custard are a match made in heaven. I’m not sure if this is a local or national thing, people from (and around) the West Midlands know it as chocolate concrete and others know it as chocolate crunch, whichever you know it as, here is the perfect recipe for you to make at home. 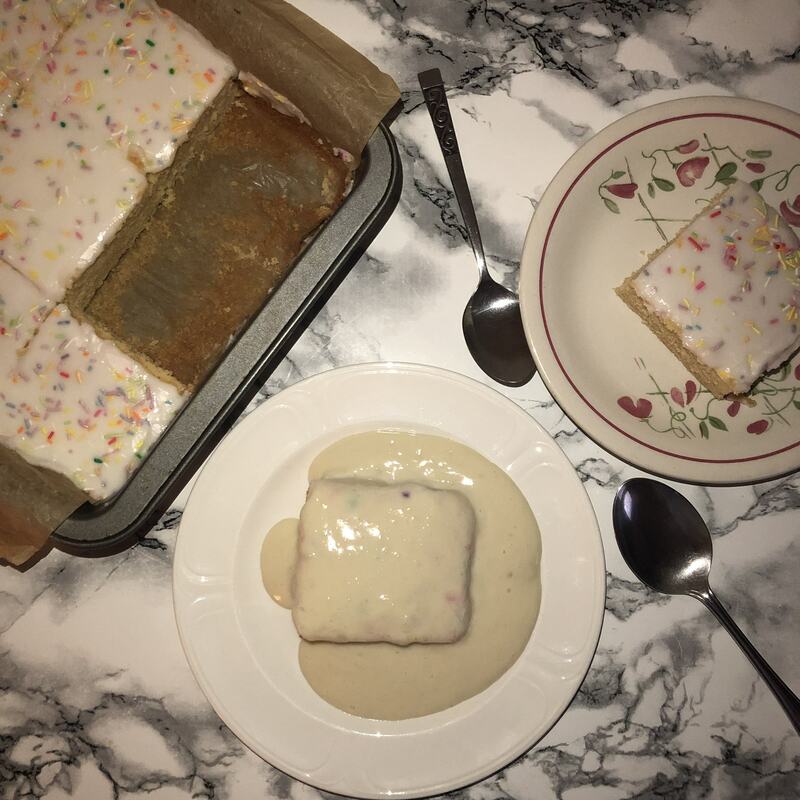 If you’re not sure exactly what it is, well… It’s a traybake biscuit x cake, it’s not one or the other, it is it’s own thing. You can enjoy it on it’s own or with a serving of pink custard. This is probably one of the simplest things to make, like ever. It only requires a few ingredients, minimal mixing and a short time in the oven… Why don’t you make a batch? So, to make the chocolate concrete dough, place all of your ingredients into the mixing bowl and mix until a clear dough has formed. That’s it, seriously it’s that simple. 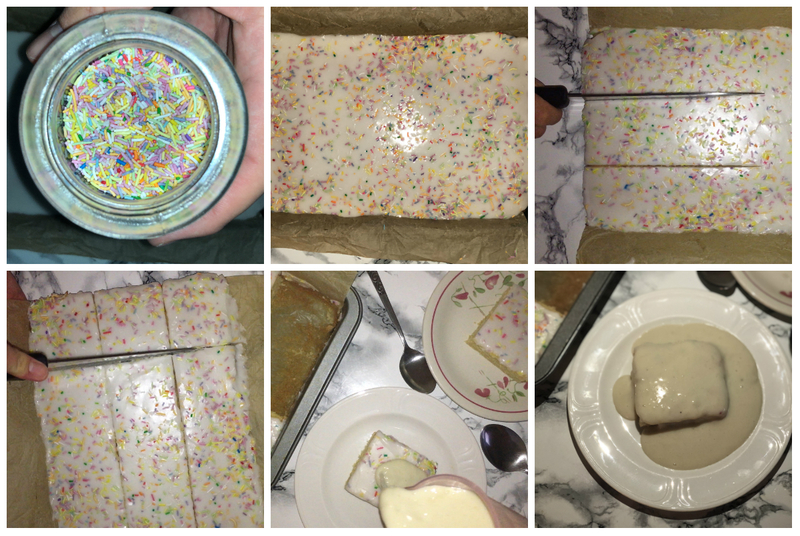 You place that into your 8 inch/20cm square cake tin, bake in the oven at 175˚c/350˚f for 25-30 minutes. While your concrete is cooling down, you can make your custard. It doesn’t take that long to make, you will want to make it just before you intend to serve it. I’ll leave the full method down below, if you’re interested in making them. Once fully baked and out the oven, you’ll want to scatter a generous amount of sugar on top and allow it to cool completely before you serve it. This is best served either on it’s own or with a generous serving of the pink custard. Bake at 175˚c/350˚f for 25-30 minutes. Start by weighing up all of your ingredients, preheating your oven to 175˚c/350˚f and preparing your 8 inch/20cm square tin with greaseproof paper/parchment paper. Place the flour, baking powder, cocoa powder, sugar, butter and egg into your mixing bowl and mix them all together until a clear dough forms. Once your dough is ready, transfer it from your mixing bowl to your lined tin and press it into all the corners and try and get it as level as possible by pressing it down using a spatula or cup measurement. Place the tin in your preheated oven and bake for 25-30 minutes. Remove from the oven and scatter over some granulated sugar and allow to cool completely before cutting. Start by weighing up all the ingredients you will be using to make the custard. Pour the milk into a medium saucepan and place it onto the hob over a medium heat until it reaches a boil. In a medium sized bowl, place the egg yolks, sugar, vanilla extract/bean paste and flour and mix until it’s well combined and become one consistent colour. Once your milk has come to a boil, add a small amount of the milk to your egg mixture and whisk constantly. This is to temper the egg mixture so it doesn’t scramble when you add the remaining milk. Add the remaining milk and whisk to combine. Once combined transfer the mixture back to the sauce pan. Add a small amount of colour paste and whisk that in until combined, then return to the heat and stir is with a spatula constantly until the mixture thickens. *please note the custard doesn’t thicken very much, this is because it’s a pouring custard*. 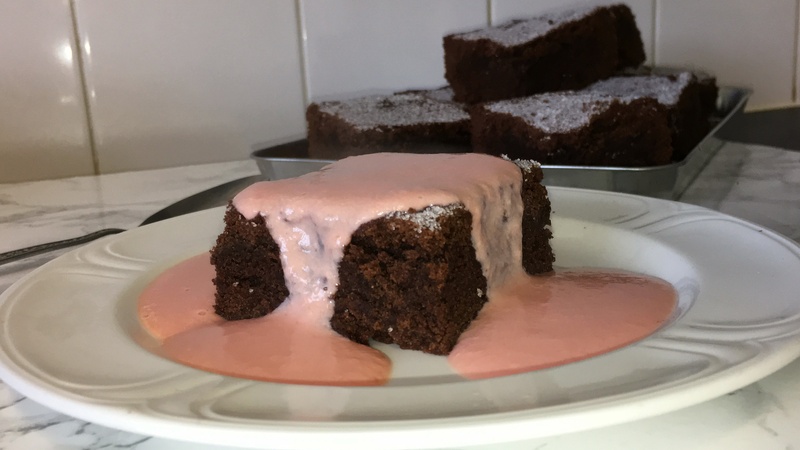 Slice your chocolate concrete up into squares or rectangles and enjoy it either on it’s own or with a generous amount of the freshly made pink custard on top and tuck in straight away.